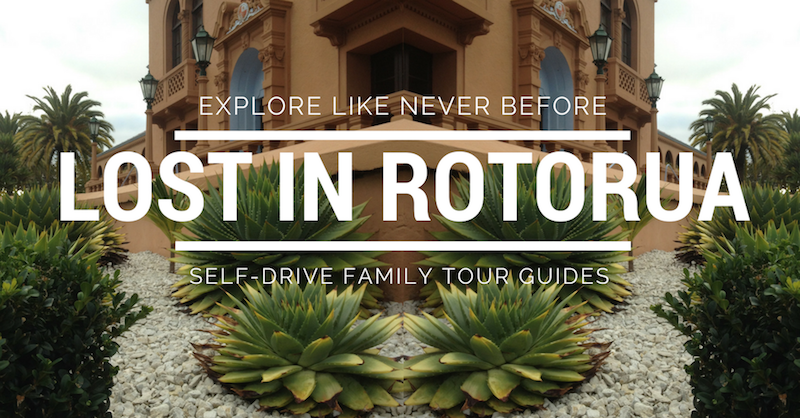 Lost in Rotorua Self-Drive Tour Guides for Families are ideal for those times when you've run out of the paid attractions you want to visit, maybe the budget has maxed out or you're just wanting to add to the fun of exploring the Rotorua area more in-depth. 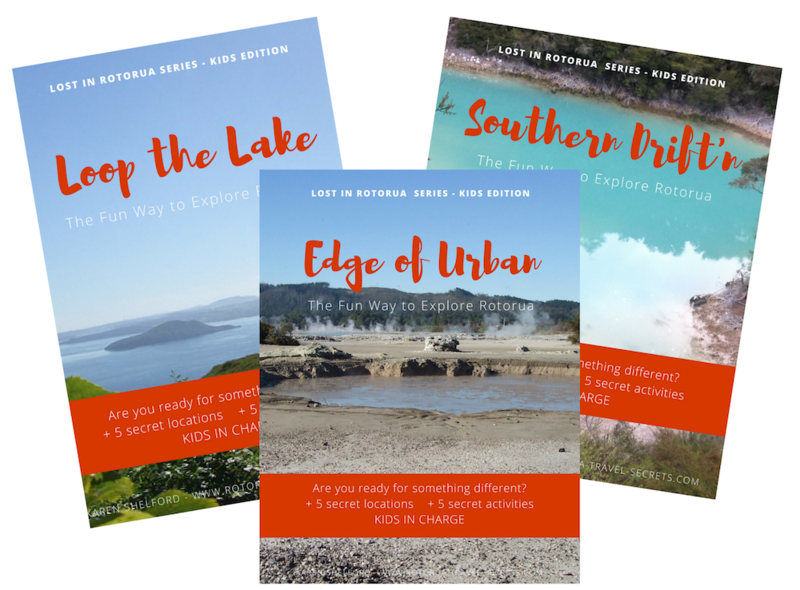 To make it a breeze for you I’ve created an eBook series of inexpensive, self-drive tour guides that will help you and your family to explore like never before. Each guide sees you visiting 5 secret locations (secret from you that is, you'll see why shortly) taking in rumbling thermal activity, swift flowing rivers, places where you can slip back in time, playgrounds for the kids, and more. 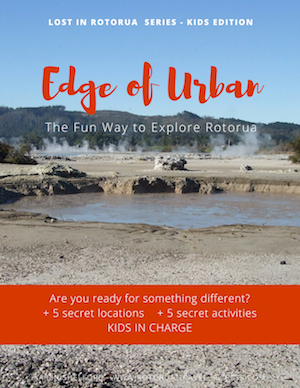 The whole purpose then is to explore unforgettable places in Rotorua while experiencing an atmosphere of intrigue mixed with mystery, having fun, and leaving with lasting impressions of magic and mayhem that your family will laugh about for many years to come. You know, those nostalgic, “Remember when…” moments every family has. Sigh! Don’t you love those? That feeling? It can't be found in your average tour guide or itinerary. With the ideas and prompts provided, hopefully your family leaves with some extra special memories. It all starts by leaving the watch behind and slipping into Rotorua time - yes, just like Fiji time - kicking back and letting the kids get to work. Although I talk about the series being for Families, I've named the guides for kids in order to give them ownership. Imagine the delight on those small faces and the sparkling eyes when you’re wowed by their next surprise location - unknown to you of course, wink, wink. They will feel so important, and so proud, and if they didn’t already have plenty of confidence this would surely be a great way to instil some. There’s nothing like a sense of responsibility for showing your family a good time to make you feel grown up. As for you? Well, like I said, you get to kick back (mostly, there is some preparation). There will be no need to wonder how to occupy young minds, no constant “are we there yet” comments from the back seat and best of all, you won’t have to scour the web working out where to go, what to do and how to do it. It’s all done for you. And, if you avoid the temptation of reading through the material, you truly will be surprised, that’s why there’s no mention of the actual locations. Ergo, Lost in Rotorua. The secrecy, if at all possible, is all for you. The titles hint at where you will go but that’s all. Now is that cool or what? 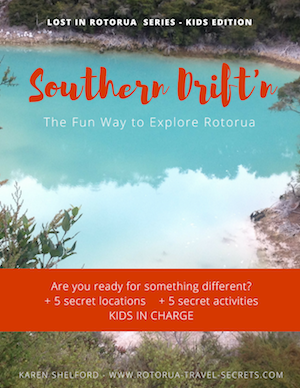 And if you're familiar with Rotorua and find you have been to some of the locations already, you can still play the game for your kiddy’s sake. Most important. As the name suggests, the locations in this guide are within a 1km radius of the inner city and the shortest in terms of travel time. For all that, it still packs a punch in terms of the places visited. You'll get up close to plenty of thermal activity (feel it on your skin too), go to church, play dress-up with the kids to catapult back in time, wander an Edwardian garden, and then, while the kids play you can relax and take in lake views. This guide explores popular spots on a scenic drive around Lake Rotorua. Walk amongst towering trees, along a bush-lined path to a thundering waterfall, pop in and say hello to little ticklers, get up high to the wackiest looking place with views to die for and finish off by getting into a zone of zen where you can forget everything. Head south of Rotorua to have fun with a mini-olympics before or after a short walk beside a picturesque stream. Travel further south to visit three thermal attractions - a short walk to see spectacular colours at the first, have a relaxing soak at the next, and see weird and wonderful muddy shapes at the last. Finish off the day at a country store with a sweet twist. 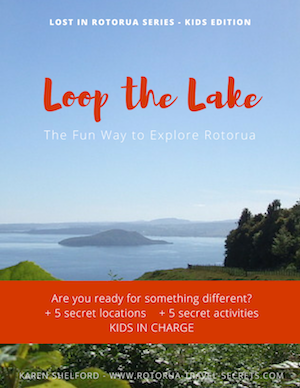 Purchase any Kids Edition of Lost in Rotorua for Only $7 right now and you’ll also receive another lasting record of your visit. Decision time. Grab a copy now to begin creating more treasured family memories. Where are the secret locations? Do I get any instructions? Yes you do. It will be available as a separate downloadable PDF document. You could always walk the Edge of Urban tour but I don't know that children would cope, it would make the day too long. You could always pick and choose what to do out of the tour though. With the other two tours, it's a no, sorry. No buses travel these routes, let alone stop at the locations.